I've been a spoiled wedding guest. The first involved a week-long stay in Denmark, ample drinking, a 16th century castle (Rosenholm Slot, the home of the real Ronsencrantz family), pounds of caviar and a chef who cooked for the Danish queen the night before. The second included a Blue Ridge mountain top, exquisitely picked antiques, a tent that could've housed Ringling Bros. and the wonderful Hackensaw Boys. When a couple puts that kind of passion and taste into their party, it sinks deep into the soul, never to be forgotten. But in general, I find most weddings to be a tremendous waste of money and energy. I almost cried when I encountered the wedding promotion posters on the facade of the Waldorf Astoria. There, sitting under the glitz and gold leaf were chairs that looked unfit for the lowest level basement Scientologist convention. These chairs not only had a faux brocade with a gold cording lining the back, that cording was covered in plastic tubing! $400 a head for your guests to sit in the living room love child of Frank and Marie Barone and Liberace. 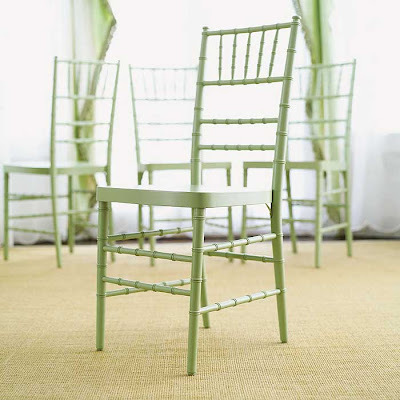 When it comes to catering, if you are to take the plunge, the faux bamboo Chivari chair is always the way to go. I love these more permanent celadon versions at Source Perrier for $155 each.